In 2005, Glynnis and her husband, Tod, adopted two little girls from Liberia. The girls were eight and ten, but were the size of five-year-olds. They had never been in school and never seen running water. The deprivation they had experienced was significant. But Glynnis, Tod, and their three sons were convinced that with enough love and time, the missing pieces would be filled in. It quickly became apparent that other issues were brewing. The challenges facing the family were immense, as they learned the older daughter had a cognitive disability and severe hearing loss in one ear. The younger girl’s issues ran even deeper with past abuse and neglect, causing significant emotional damage and life-altering behavioral issues. Expecting some challenges, Glynnis had cut back on her work, teaching, and public speaking for a period of three years. But three years wasn’t going to be enough. So Glynnis said good-bye to travel, a public teaching ministry, and book writing, certain she would have to travel and speak for a publisher to believe in her. Life was hard in the Whitwer home, as they faced one diagnosis after another and traveled from therapist to therapist and doctor to doctor. The emotional trauma of the younger daughter affected all of them, and Glynnis maintained her focus on her family for years. Although Glynnis longed to serve God through her work at Proverbs 31 Ministries and through her book writing and public speaking, it seemed He had other plans. God could see something coming that Glynnis never saw. He saw the world of the Internet opening up opportunities for women to minister from home. No longer did authors have to travel and speak to get a book contract. Emerging were new ways to write, teach, and minister to women that hadn’t been available before. As Glynnis submitted her dreams to God, He repackaged them and gave them back to her. God opened up opportunities for her to move to an executive position within Proverbs 31 Ministries even though she lives two thousand miles from the home office. God established COMPEL Training, where Glynnis gets to teach monthly to over fifteen hundred authors, and He has blessed her with multiple book contracts so she can fulfill her dream to write. God won’t waste our wait, and neither should we. How are you currently handling your wait? Leave a comment to be entered to win a copy of the Wait and See: A Six-Week to Waiting Well Curriculum Kit. 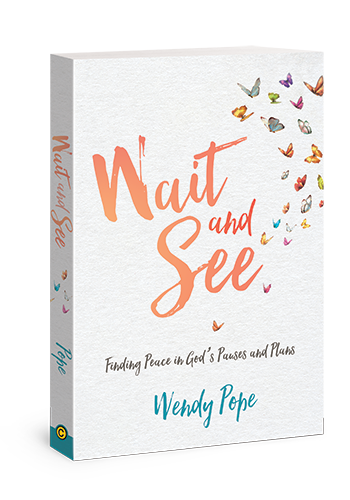 Content different from her best-seller Wait and See: Finding Peace in God’s Pauses and Plans, Wendy teaches readers how to wait well by studying the lives of six individuals in the Bible who either waited well, or did not wait well. This Bible study kit explores how we can view God’s pauses as opportunities to know Him better. The Wait and See DVD provides six ten-minute teaching videos from Wendy Pope that correspond with the participant’s guide. The entire curriculum is covered during the Bible study, and there is no outside homework or additional reading. This Bible study kit is ideal for small groups to explore living peacefully during faithful waiting. 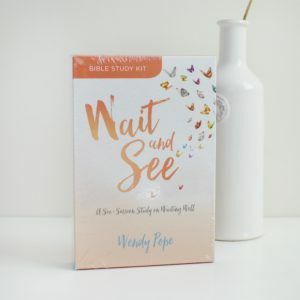 This Bible study kit includes Wendy Pope’s Wait and See, a leader’s quick-start guide, a participant’s guide, and the companion DVD. Because I don’t wait well, I rushed into a 2nd marriage with my two children who were 12yrs. & 10yrs. at the time. This turned out to be a controlling & abusive marriage. My children & myself came out of this situation broken. They are adults now & 2yrs. ago I learned from my oldest son that they went through a much more difficult time than I previously had thought. Their relationship with God has been questioned & they have not completely forgiven me for putting them in this situation. I am praying for reconciliation & forgiveness. I was not patient & am paying an enormous price for it. Thank you for your reminder that the Lord can redeem this situation…now I must be patient & wait upon the Lord. how long should we wait, just like my partner told me to wait for him.until i had to hire a very good hacker FIRMHACKER AT GMAIL DOT COM, and found out he his already married. please investigate your partners. I bought your book during a season of my life when waiting wasn’t going so well. I so desperately wanted a baby and after test, miscarriages, and failed IUIs I was frustrated and defeated. Each appointment I went to the song “Good Good Father” came on the radio and it felt like God speaking…but I didn’t understand why I was still waiting. I truly felt like God was telling me no more infertility treatments and that I needed to trust him. It was hard! Very hard! I decided to listen and take a break! I now have a beautiful 2 month old baby girl. I still don’t understand why I had to wait but the wait was so worth it. I have hopes of helping others in their season of wait and would like to lead a small group. This kit would be an amazing tool! I don’t wait well! I’m in a waiting season, and it’s so hard not to move forward of my own accord. I’m grateful this study is still available. I missed participating when it was an OBS. I’m hoping to have the opportunity to do this study soon. I would love to study out the ‘wait & see’ study with Wendy. I am currently struggling with waiting in this season I am in now. I would love this study! I am in a waiting season and love the idea of waiting with God not on God! I need to be reminded of this as my husband and I have decided to try for a family but the timing is not going as planned! I would love this study! I was blessed by Wendy’s book as a P31 Online Bible Study, which I led a small group of ladies in my neighborhood to study. I’m so happy it is now a DVD study! My group and I were so blessed by the book and the Lord taught me a great deal through Wendy’s writings. I am so guilty of not waiting well; I am a doer and a fixer who tries to “help” God if I feel He’s not moving fast enough or He’s forgotten my prayer! Wendy’s guidance of how to wait and what to do while you’re waiting has helped me tremendously. I would love an opportunity to lead another group of ladies in this study, as we have moved to a different town and have a new opportunity to start a Bible study group here in our new neighborhood. I was excited when I opened my devotion today and saw your name, and even more excited about the topic – since I knew just the person that needed to hear about waiting, you know the friend. The more I read the more I realized that God was speaking to me! I am a helper and tend to plan in advance the best I can to help every situation along. When I think of Sarah and the consequences of her help that we still feel in the world today – it gives me pause – that’s for sure! I have a feeling this study would be life-changing for me – and to share it with others in a small group would be a blessing! I know God wants me to lead a small group of women and I have been waiting for God to speak to me on what my Christian friends need. I think this is such a great topic for us all. I am blessed with 4 children, a single mom for 7 years now (kids ages 8,8,11,15). their dad has me in court in 2 different counties at this time. I can see the blessings in the wait. This helps me to see that there is purpose in the wait. I would love to see what tools are suggested in this study to help during the wait. Currently I am surrounding myself with fellow Christians whenever possible, I read my Bible daily looking for answers/ help in the wait. I read my devotionals, have a prayer partner, listen to worship music, speak to God throughout my day…I am currently working on listening better for His voice. I am tempted, at times, to take matters into my own hands (Lord knows I’ve done it in the past) but I do want what God has in store for me. I would love to experience this 6 week program and share it with friends. I so need this study!! Today’s devotion was spot on, God directed at me!! As a 44 yr old single mom, I’ve been longing for a Christ centered relationship, but have been compromising, not trusting God to handle it. Like Sarah I have tried to “help” God along, not exercising patience for His timing. Prayers appreciated!! I am not a pleasant when it is comes to waiting and right now God has paused my life tremendously. I have been waiting 4 years for my marriage to become whole again. I try constantly to take matters in my own hand which hinders it more. I know God has paused it for a reason, but it is so hard for me to wait knowing that time is wasting and is so precious. At times I forget that God’s time is the best time and that He can redeem ALL time. Everyone who dares to dream waits. Wait and See taught me the importance of waiting well for my dreams to be fulfilled. Some days I wait better than others. I’m excited that Wendy has written a new study to show us how six women of the Bible dealt with their waits. I needed to hear this. My husband and I have been searching for 3 years for our forever home. There have been times we wanted to settle for something leds than we wanted but God never would let it go through. We have found a home that has everything we want and more but so much red tape. I keep telling him, Gods timing is perfect. This message today reiterated just that. Thank you for this message. Thank you for the teaching on waiting. I read your devotion on the Proverbs31 page this morning and the “waiting with God instead of waiting on God” statement really resonated with me. Not sure what my dream is. I am 53 years old and so very blessed. Thank you for your ministry. This is a practice many women in our church are learning. What a wonderful study to have. Waiting…Yes, something I am not good at and end up taking matters into my own hands! Loved reading the comments and the devotional this morning. I’m 57 almost 58 and waiting has always been tough for me. I would love to have the DVD series to share. Trusting with God in this waiting time of my life. He’s got plans if I wait for them to unfold. I remember my mother telling me as a child, “You’re wishing your life away.” I always was anxiously looking forward to things – Christmas, my birthday, summer vacation, school starting, my aunt and uncle coming to town. Even now as an adult on Monday I look forward to Sunday’s afternoon nap! It’s obvious to me after reading your post that I have suffered from tarryitis since childhood! Current symptoms (beyond nap fixation and exhaustion) include knowing God has more for me coupled with foot tapping and anxiety. Thankfully there is a remedy! I feel encouraged knowing that others who have failed at waiting have come through to be used mightily by God. I look forward to learning more about their stories in your book and it’s companion book the Bible! Maybe God will open a door for me to lead a support group for others suffering from tarryitis one day. Guess I’ll have to wait and see. Oh man, here I go again! Would really like to do this study. I don’t know if I’ve ever waited. My plan to move always seemed better , faster and of course seemed to put me back at square one at times. And how many lives have I affected by acting on my own ? I finally “got it” , surrendered all and am committed to work on prayer, listening and waiting . Will look toward to this study . I have been frustrated with January, feeling sick and unable to get a jump on all these resolutions and big plans I felt God had let me dream up with Him. It never occurred to me that perhaps He is having me wait! And that I can wait with Him and be enjoying His presence right now! Over the years, God has helped me to learn the importance of waiting on Him. This has come out of experiencing the consequences of NOT waiting on Him. Waiting is HARD. Without relying on Him, I tend to go for my own agenda and plan instead of His. Trust God. Wait on Him. His timing and His plan are perfect. Thank you for your ministry. Blessings!!. I’ve raised three beautiful children while simultaneously obtaining a Bachelors degree in Religion. I waited years for God to use me in Women’s Ministry, often times trying to “help” Him along the way. Quite by accident, I am now the Women’s Ministry leader of a fledgling ministry in a small country church. It is still a time of waiting, a time of “yes but not yet” from God as our tiny ministry grows and God’s vision for it comes into focus. A time where God shows me His new purpose for my life as my children start college in the next couple of years. An exciting time as I learn to wait with God and not run ahead. In a heartbreaking situation where waiting is my only option. And I’m not sure how long the wait will last. Thank you for reminding me to wait with God, not on Him. I could really utilize your study. Thank you for the opportunity for a chance to win. Thank you for this reminder. I loved the Wait and See book, but I’m still waiting in the same situation as when I read it and I’m getting impatient again. I need to do this study again. Maybe this time I will learn more. Blessings. This would be great for me to do at home. The past 4 years God has allowed cancer to call my husband home 10 days before our youngest sons 16 th birthday, see that same hurting young man get expelled from the Christian school he grew up in because of a choice he made, and now struggle in large public school for his senior yr of high school with a hard heart. How I pray for God to soften his heart so he would truly repent. It’s been years. On top of that I’ve been diagnosed with an aggrressive for of breast cancer. Hard to see things differently most days. Would love to have this new study to share with a group of women from church.I think as women ,we all suffer with impatience ! We do NOT like to wait & our society has made that worse. Learning to wait on God’s timing is something I NEED in my life,too! Thanks for sharing what God has laid on your heart. For the most part I’m doing better “waiting well” after reading your book Wait and See (it really was a game changer for me) but there are still days I become impatient and frustrated God doesn’t move as fast as I want him to. It is on those days that I have to remind myself that He has a purpose in the wait and He works all things out for good for those who love Him. Thanks for the giveaway. I can’t wait to go through this study with my Bible Study ladies. Wow. My heart really needed to read this today! I am a horrible ‘wait-er’. Well, actually if I know the plan, I have tremendous patience. It is the NOT knowing that makes the wait so hard, and really discouraging at times. I tend to feel the dreams and deep feelings I have, that the time has passed, or that they really aren’t a dream God would answer. I would just love to have this curriculum to teach at our small church!! Learning to handle the wait ,better than last week ,and the month before that. The last year has been the biggest wait, of our journey with the Lord. How ,do we do this? my husband lost his job, we moved in with my son, and his family. With a call on your life, where to you go, when the wait and see is not yet answered? So handle it with a new love, a new hope, and or course a new joy. How long will this wait be? t.
Waiting is such a challenge! Patience is hard but I believe the reward is so much greater when I can see it’s God’s ultimate plan. I would love to do this study with a small group of friends. My husband and I just left a very difficult season of waiting. There were many tear filled nights, full of praying, reading, and asking God when, why, and how. But as we look back, we can see God’s fingerprints all over our lives and our waiting. And we are confident that God has a plan for our waiting and has recently birthed a beautiful ministry to be able to encourage other couples through hard times. God is good!!! My youngest left for college 800 miles away in September. Last night she told me she will be staying there this summer, she got a job on campus. My wait? Wanting to be, live near my children, my heart aches with missing them. My wait? To be in a relationship, to be married, to share my life with a godly man. My wait? To get out of debt. Your message today was a gift, thank you. Hi Wendy, I was the musician when you spoke in Regina for Jacquie. I enjoyed your devotional. Is this Bible study good for a small group of 4 ladies. We are just finishing another so I am looking into yours. Thank you for your continuing ministry. We appreciate your words of encouragement. Thank you for sharing Glynnis’s Story. I too, needed to hear this message. I’m trying my hardest to wait for the Lord to bless us with a baby. I’m 42 and and would love for my daughter to have a sibling. It’s very hard to wait and not lean on my own understanding. But I know this is in God’s hands. When I was younger I felt God had something for me to do. But the things I felt the Spirit leading me to never panned out, with church leaders indicating they felt I had the abilities to do the job, but couldn’t give it to me because I was a woman. Now I’m older. I’ve gone through marriage, widowhood, empty nest and am in a second marriage. I think, even if those opportunities arrived, I simply don’t have the drive any more. It feels like my dreams of usefulness will never be accomplished. I am in a season of waiting for my son to return to the Lord. I also lead a group of single young women who are all waiting for the one God has for them. This study would be wonderful for them! Thank you for this! I do have a tendency to rush ahead of God and try to foresee His plan. I spend way too much time and effort trying to figure out where He’s going instead of living the abundant life He has given me TODAY! I want to learn to wait well, being content to simply walk in His presence as He figures out the details! I am so thankful that God is patient and waited many years for me to return to Him. So now, he gently reminds me that I have to do the same concerning my 23 year old son. It’s so hard watching the children of friends and family move into what God called them to do, all the while knowing God has a great plan and working in ways I cannot see. An encouraging song by Bethel music is “Take Courage.” It reminds me that He is in the waiting! I hate to admit it, but I don’t wait well. I want to know what God has in store for me. And I want it now. I am working to learn to wait well, but it is a process. Thanks for the blog post and devotional. I love how you pointed out the difference between waiting on God and waiting with God. I’m currently waiting for a house. Our family is outgrowing our apartment, and we want our next move to be a house. But we discovered we won’t be able to get a mortgage with a decent rate for another couple years. When I found that out, I felt like the walls of our apartment were closing in on me. But I prayed that God would help me be content with where we are and give us ideas for how to make our space work for us better. He has done that! While I don’t love our apartment, I am content and satisfied with the changes we have made. Waiting is hard! I’ve been waiting for my next full-time job since the company I worked for was sold. I strive to keep my eyes on God and not on my circumstances. I teach a Sunday school class of single women, and it seems we’re all waiting on something! Thank you for this giveaway. I’m sure there is much wisdom to learn from it. I do not wait well and have jumped in, taken over and then regretted that decision as the outcome was not been.favorable and many times ended up hurting a loved one. I have been waiting for years for my husband to SEE his family and not just provide for us by working 7 days a week. It has made me angry and so sad to see the hurt this has caused our marriage and our grown children. I pray there is a silver lining that God has in store for all of us. This couldn’t come at a better time for me, Wendy. Would be blessed to learn from the biblical truths in this study to wait well for what’s on my heart. God came to my husband and I and told us we are to sell everything and go to Belize and help the people. needles to say we are being obedient. W thought it won’t take long. How wonderful to have been called. Meanwhile it is 16 months later. We are still here. We need to sell everything to find this trip. We live on social security. It is ver difficult to wait. We know God’s timing is perfect and he had s reason we are still here. It is good to know that other people struggle with waiting on God. We know his timing is perfect. Does not mean it is always easy. Your words of encouragement and this study are perfect timing for me as my husband and I are going through some major life changes right now and are waiting on God’s timing. We want God’s best and not settle anymore. Please help me to wait well with You. Give me a quiet heart and the faith to trust when I don’t understand. I have struggled with being still and waiting in God. I was becoming very anxious on the verge of crying sometimes. Thank you for this. I will go back to even more prayer and meditating. I will trust in him and continue to have faith. Thank you. My husband and I are both in a season of waiting; we just don’t know what we’re waiting for. We both feel a little anxious and unsettled as if we’re supposed to be doing something but we have no idea what that something is. So we wait. Some days we wait better than others. Some days we consider doing anything because it has to be better than nothing, right? We would absolutely love to be able to study this idea of waiting well together. Thank you for this post today! Hi Wendy, Thank you for your teaching on this topic. I have MUCH difficulty IN THIS AREA AS WELL. i am legally blind and have been for 35 years. I lose more sight every year but the doctors still don’t know for sure what I have. I feel like I’ve been waiting to find this information out for all my life. Now I’m waiting on the Lord to do what He will in my writing career. I just learned the computer a year ago because I fell through the cracks in school so I had to wait to learn the techy stuff. Now I have a blog and God has layed it on my heart to start my first book. I will have to wait for the process and see where He leads. Thank you for your obediance to God and teaching others about a very difficult subject to conquer. Blessings. I am a 34 year old mom of three young boys. I have dealt with mysterious yet debilitating health issues over the past five years that have stolen away some very precious time & therefore opportunities to make memories by leaving me unable to function normally (unable to drive at times, severe stomach pain and terrible headaches/dizziness). The doctors don’t find anything wrong so I keep searching for help & hope wherever I can. I feel like I’ve been patient (5 years is a long time to wait for healing) but I have discovered it’s less about the actual time passing than the attitude & mindset you maintain. I’m working on waiting well as I now realize it’s in His time I will be well again! Thanks for the opportunity to win this impactful study! This season of waiting has been so hard. We have been trying to downsize from a 6 bedroom house to a much smaller/less expensive house. I know that God has been faithful to provide all that we need but it is so hard to remain patient. In the meantime, I am trying to dig deeper into my relationship with the Lord. Praying for my children and my husband and their relationships or lack of relationships with the Lord. Also praying for grandchildren that I don’t get to see but God does. Hi Wendy, I wish I could say that I have been waiting well..but that simply is not the case.😔 I let my frustrations with the situation get the best of me and took matters into my own hands, as you can imagine it hasn’t worked out well for me so instead of being #7 in the waiting line it feels like I have moved back to #750… I know God can fix my mess but will he? That is the big question… Right now, I feel like God is a million miles away and I just don’t even know what to pray anymore. I am in a season of waiting. I am blessed to have the time to wait it out, but, I feel that I should be DOING something else in the mean time. What DOES He have in store for me next? Just what I need to hear today! I am raising two of my grandsons it is very hard. I had to quit my job of 8 1/2 years because the oldest one has seizures and a mild case of autism. I really want to be out in the world mingling with people trying to shine a light but I’m here waiting on Gods timing. Really think this would be a great study. Being in God’s waiting room is not easy—and at 69 I’ve been there many times! God has used His word and many different individuals to encourage me during those times. Some of the hardest times have been when the waiting was for my children whether young or now as adults. My heart’s desire is to encourage others as they wait even as I am now in a “waiting room” of my own. I volunteer at a pregnancy center in our town and know this series would benefit many of the girls/women in need. God is faithful all the time. Thank you for sharing your friend’s testimony and encouraging us to wait with God, instead of waiting on Him. I am staying faithful in prayer and God is directing me to messages and lessons such as yours. Thank you for sharing your knowledge. Thank you for the message today. I had to smirk as I am trying (really hard) to wait and to be still and hear God’s plan on a matter. Thank you for the opportunity to win the six week study. Timely word. My husband and I were just talking about the seasons after our Sunday school lesson on Sunday and realizing we are in that “waiting” season. You have encouraged me to enjoy the journey of waiting and making this an experience and not a “nap” so to speak. Thank you for the opportunity to win the six week study and also the encouragement to make this a profitable time in our lives. Blessings. God is helping me understand the value of why and where He has placed me in my current job. For a time, I felt like my dreams were dying, but I know now that God is in the process of healing, refining, and revealing HIS design and desires for me. I’m thankful for the waiting because what God is doing inside me is so much more beautiful than I ever dared imagine. Wait…not my favorite word either but I so do like a good challenge! I appreciate your realness and your hope in what can and will be when we stop trying to push goals forward by rushing and stay in a place of wa it with God. He does always come through! Waiting has never been my forte, let alone waiting well. Funny because I was sharing this past weekend with my 18 year old son that he is a lot like me in the slowing down and waiting…shall I say lack thereof…he doesn’t. He, like me, is a let’s get things done and resolved. I’m learning through his own adventures how I too want things right away and need to slow down. I found with every word I shared I needed to apply to self. In this season of my life, waiting has been much better than in the past. I’m sure I’m in that waiting season right now in regards to quiting my job. I know I can’t now, but oh how I wake up some days wanting to cry because I don’t want to go to work. Then God reminds me why I’m there as soon as I arrive. A coworker will knock at my office door and ask for prayer or for some advice, or a patient who I need to schedule an appointment for comes in shattered, broken and depressed, feeling hopeless and God strategically places me there to be able to pray for them at that very moment. In this wait I’m learning to embrace these cherished assignments. I’m in my 30s and single and have been waiting on the Lord to bring me a godly husband. As we all know in our society today, mid-30s and single is when people stop asking if I’m ever going to get married. It’s been a real struggle with hopelessness and loneliness and wondering if God has forgotten about me. This mornings Proverbs 31 email featured Wendy speaking about waiting with God instead of on God and I loved that insight. I know I’ve been waiting “on God” and getting frustrated that he’s not doing what I think he should be doing (like many of us do). I’m going to start praying that God shows me what it is to wait with him. Waiting is a real struggle if we allow ourselves to take our eyes off of Jesus. We must shift our gaze to the perfecter of our faith! Wow! This is just the message that I needed today as I am going through this very situation. I am having a hard time waiting! I guess I want a new house to just appear out of nowhere! I know that it will happen on God’s time and I just must wait! I am currently waiting to see God do the impossible miracle. Through ongoing prayers and tears I am still holding on to the promise that God would give me the desires of my heart. I am barely holding on but through the struggle I am holding God to his word. He promised me and I believe I will see and have what I am waiting for. Everyday is a struggle but I keep trusting God for the impossible to become possible. I am holding God to his word and his promise! Yes learning to wait it hard. I’ve been waiting 28 years for my husband to come along side the Lord. It’s been a tuff having him get upset with teaching my kids about God, taking them to church and baptizing them. I feel so alone in this journey of raising our kids to love the Lord and to follow his ways. Religion is a subject we can’t talk about. I love the Lord and have quite time daily. He is my strength. When I see how some people in the Bible had to wait so long for their answers it gives me hope that some day my prayers will be answered. Would love to study this book with my small group. Thanks so much for this timely devotional. Within the past 2 weeks I underwent serious retinal eye surgery and my vision is still blurry but I’m hoping the procedure has been effective. I won’t know the results for a few months so the title of your Bible Study DVD caught my ‘eye’! ‘Wait and See’ is just what I need to work through the impatience I seem to have in numerous life situations. I want to “see the good in all things” Romans 8:28, as I wait with God. I’d love to be able to share this Bible Study with my family and friends. I am also in a season of waiting/beating myself up… (not literally). I find myself complaining like the Israelites in Exodus. And, sitting around thinking of things I should have done or could be doing, like Sarah I want to take things into my own hands. God has called me into this season of waiting and resting and it is so hard not to focus on all of the things I could have gotten done in this time instead of focusing on my time with God and the peace He is offering. I will hold on to your message, wait with God not on God, tightly. Those words are so powerful! Thank you!! I am not very good at waiting. Patience is not one of my virtues. I have made so many mistakes because I decided to take matters into my own hands. I really needed to read this today and would love to have this study!!! I too have come to realize that I am more like Sarah than I care to admit. Waiting is HARD for me. After enduring so much pain, abuse, and loss in my life, waiting adds to all that I am dealing with. I know I need to be more patient, just not sure how. Wow! This was right on time. I have been praying hard about direction in an area of my life and this morning I thought to myself that I would just do x,y, and z about it since God had not allowed it to happen. Well then I read this and was reminded to step out of His way and continue to wait. Wow! He’s right on time. Thank you Jesus for sending this message to my impulsive self right on time! Learning to wait has always been hard for me. I want to fix things now! I am going through a waiting time now and your devotion was a real encouragement! I have been waiting for my husband to return to church after some “church politics” caused him to stop attending. I wanted him to come back on his own terms. But it’s been 4 years and our boys are now teenagers. I was afraid that his actions were going to affect them and the faith that we worked so hard to instill when they were little. So this weekend, after my 13 year old asked me why dad never goes to church anymore, I lost my patience with my husband and pretty much told him that he HAS to start coming with us again. I wanted him to WANT to come with us again but I couldn’t wait anymore. I just hope I didn’t make the whole situation worse. I am in a period of waiting, and it is so hard. I needed this message today. Thank you and God bless you. As a military spouse, most of my life is spent in the “hurry up and wait” position. Our family presently is waiting on orders for our next assignment. I struggle so much with wanting to plan next steps (like enrolling my kindergartener in school for the fall) but knowing all my stress could be pointless since we could be moved by then. I know God is good and is working on something so much better than I can think of. Where we go next will be His will and I am thankful for that. It is hard to put my self aside and only trust Him. He is teaching me though what it is to fully trust Him and that He truly is the only person I can trust. I am praying for al of us that we will be overwhelmed with peace and contentment as we are in a waiting season! This sounds like a great study. I have two grown children living in rebellion, and I struggle daily with waiting well for them to return to Him. I also have to frequently remind myself (or let the Lord remind me) to adjust my focus so that my eyes are set on Him rather than my difficulties. Nehemiah 8:10 says, “and do not be grieved, for the joy of the Lord is your strength.” It is so true! When I focus on Him and His love for me, He brings joy! And that joy makes me strong! …oh, that I would always remember this! I am so thankful that He waits well for me, and doesn’t give up on me when I forget Who He is! I enjoyed your devotion today. Waiting is also not one of my strong suits – I KNOW I can handle things, so I WILL take care of things myself! 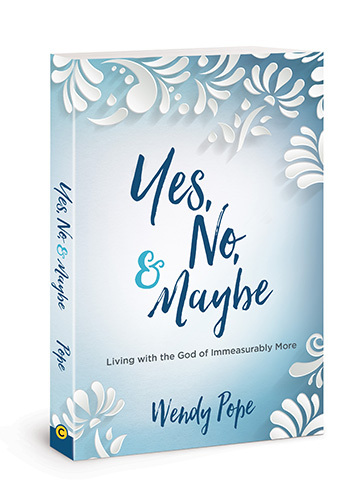 But the line in your devotion – ” shows how God redeems our interruptions and can turn our mess-ups into a message.” is similar to a section from Lysa TerKeurst’s “What Happens When Women Say Yes to God” study, which a group of us are starting tonight. God can take our “mess” and make it a message to lead others to Him. So, thank you for re-emphasizing that to me today! God Bless! I am struggling with waiting well in so many areas. I am waiting to find a new job where God wants me. It can be hard to wait when I am single and do not have the luxury of a partner to help or rely on. I am waiting to see where God leads me in the area of writing since it seems He has been prompting me to write. I am waiting for a more settled housing situation as I have been in temporary housing situations with most of my stuff in storage since my ex husband and I split 2 years ago. The housing has been anything from a bedroom in a few different people’s house to an RV to other situations. It is hard to stay so temporary for so long. I am always looking for something I have misplaced. The job will narrow the looking field for the housing as far as area, but I will then still need to decide what type of housing. Praying for God to open doors and close doors for me. And lastly there is a desire to share my life with someone. So many things in the unknown area and so many decisions to be made. Waiting isn’t wasted, but sometimes it is exhausting when I don’t always have the peace or perspective I need. I don’t wait well! I struggle with waiting on God vs going after the dreams I feel He has put in my heart! What is waiting and what is obeying God? I know God’s plan will happen, but for many years I’ve felt like a pawn in a Devine chess match…just bounced around for His entertainment. I know it’s the wrong train of thought, but He isn’t giving me any feedback that I can understand…just contradictions! I know what it is like to feel as if you’re bursting at the seams and so ready to let out the deep desires and dreams of your heart. Patience is a virtue of which I have not had an abundance. However, God has a plan and it will be in His own timing & in His own way. That’s what He taught me. To finally let go, be patient, let Him open the door, & to soak in what I can. To learn and grow in the wait, knowing that it is all a part of His preparation in me for His work. That has been and still in many ways, continues to be my lesson. I am thankful for His lessons, for teaching me the real value of patience, for growing a deeper passion in my heart for His word, for showing me how to see the world as He does, and so much more. Mostly, I am thankful that He places us in seasons of wait, those places where He grows us and molds us into the women that we are meant to be in Him. He knows well and I have to trust Him there. How am I currently handling my wait ? Not real well. Patience has never been a virtue of mine …. This is certainly a topic that many of us struggle with. I would love to win this study to share with my ladies group. I prayed and waited with God for 11 years for my dream of home ownership — which God granted in December 2017, and only in such a way that my husband and I knew without a doubt that it was from God’s hand. Waiting is hard, but God’s timing is best and beautiful and more amazing than we could ever imagine! I am now a part time Women’s Ministry Director at our church and I see women who struggle with waiting all the time. I think this study would be perfect to share with them! I am currently in a waiting season…and it’s one of the hardest thing I’ve had to do. I fight through the tears and pray for strength every day! This spoke to my heart this morning as I know it came to me for a reason. It is exactly what I needed! I need AND want to wait well…..but I don’t. The Lord is teaching me about waiting well in this season and I know that I will come out the better for it. I pray that He keeps me steady and that I don’t get in front of Him. I’m 67 and have been in a period of waiting. I strongly feel that God has a plan for me and I just need to be patient and know that what God is working on will bring me much greater happiness than I ever believed possible. At times I want to take the reins and make my own desires happen but then a quiet voice tells me to stop, be patient and allow God to do his work. I opened up my email this morning and saw your title and laughed. God’s timing is perfect. My husband and I have been missionaries and in ministry for years, but the last 4-5 years, we felt that God was leading us to something else, but He hadn’t made it clear yet. So, the temptation to move out on our own and ‘make something’ happen has been something we (I) have been struggling with. Thankfully, we balance each other out and he helps restrain me! 🙂 In the past few months, God has brought an amazing opportunity for us and we are in the process of selling our home and moving back overseas. There are still other areas we are waiting on God for, children to come back to the Lord, parents in difficult health situations and yet, we continue to trust God that He has that in His control and we only need to be faithful. Thank you for your devotional this morning. I love proverbs 31 ministry and am thankful for the on-line connections, especially as we move again overseas. Thank you for your ministry. …..how to put into words….just tears….love to you, thank you. I am currently waiting and its extremely hard, however each day I’m being strengthened by God. I have quote a few friends that are also waiting so if I win this kit I will host a group on waiting. Thank you Wendy, for listening to the Lord’s leading and blessing us with this study! I love the idea of waiting with God instead of on Him! Waiting is so hard! Especially in our fast paced world where we want everything now if not before! Sometimes I think I’m progressing when it comes to waiting but then here comes the test & I think, what was I thinking! One step forward, two steps back it seems! It’s all progress though as long as we are moving forward. I have never been good at being patient or at waiting. Thankfully, God is showing me more and more through His Word to wait on Him; His timing is perfect, His ways, and His thoughts are so much higher than mine. I am not good at waiting well…never have been. Currently, I find myself in another season of waiting as my husband was let go from his job on 12/10. I already teach pre-k part-time, but have applied for a second job and he’s been putting his resume out there, and yet we wait. I feel like the Israelites in the desert. They received their manna a day at a time. They couldn’t check their bank account and see it building up, or open their pantry and see the surplus. They had to wait for their provision. One. Day. At. A. Time. Reading that story it was always easy to think “you ungrateful bunch of chosen people.” Living it. I find it is much more like, “Wow, I totally get how those poor people were feeling.” I know they weren’t “poor people”, but in this season, I have much more compassion for these followers who were literally living day to day. But I don’t want to be ungrateful like they were, I want to shine through this season. I want to honor God with each day’s provision, not grumble because I don’t see more. Lord teach me to wait well. I would love to win this offer, because I have been trying to get my large church’s Women’s Bible Study to do Wendy’s study, since it came out, but they keep choosing other well known authors. My dream is to get the ladies at my table (all different ages) to do your study separate from the larger group, then we will have more voices to ask that it be done by the larger group, (and maybe the smaller daytime mother’s group). I was on the launch team for Wait and See and I believe in this book, that is why I keep pushing for this study to be done. I’m also a four year follower of RTW. Thank you for this opportunity to win this package and share. Be Still and know that I AM GOD… the word that’s been telling me to wait. This message is right on time, a reminder that in this time of waiting that I am to seek Him in order to wait with Him. I,also, tend to hurry up and do/go/get started! Recently, though, my Abba Father has sat me down, in a way that I wouldn’t choose for myself. I’ve tried to rush the process, all while knowing that His timing is perfect, and He knows best. With each attempt, I’ve been met with undeniably God’s Hand firmly reminding me to wait. He’s up to something grand, and through this period thus far, He’s shown His faithfulness, asking me too show Him mine. This devotional would be a blessing to whomever receives it. 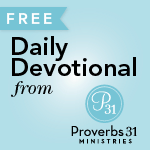 I’m not doing too well waiting WITH God, as you explained in your P31 EFT devo. I feel like I am probably pulling a “Sarah” & taking things into my own hands. Please pray that I will start being able to apply all the truths that I know & learn patience & endurance while growing closer to God during the wait. I bought the book when it was released as I was going through a rough time after a not so great break up. It really helped me get through that time and helped me to “wait” and I now have the relationship I have been praying for! I have been contemplating going back and rereading the book as I am now in a season of waiting again as I am struggling to find a job after graduating college. I am waiting; I have waited 60 plus years to finally shed the weight that the world says will holds me back from the best life. I have tried – no luck. But I feel God has used this overweight child of God for good. Being overweight has taught me virtues of compassion, love, unconditional acceptance that I would not found yearned for and learned to past on to others if I had been normal weight. So now I wait with God. I am happy with who I am regardless. With God I have value. With God, my body will become the body he needs for me to serve him best. In the meantime, I will eat to nourish my body and seek his guidance and wait. Ok, wait a minute while I wipe my tears. Thank you for touching my heart by telling that story of Glynnis and thx to her for allowing you to tell it. I love her writing because I find we are very similar. Thank you for your P31 devotional today as well. What a difference a word makes! Waiting with vs waiting for God. A world of difference in spending time with God and trusting Him vs. tapping my foot about when He’s going to finally do something. I experienced recently that moving ahead of God just adds churn, anxiety, and disappointment when things don’t work out like I want (because I obviously don’t have the best plan and can’t see what He sees). Thank you for this a-ha moment of truth that shines a spotlight on my impatience. Everyday brings me greater awe and love of my God who is so good (and patient!). The past 6 months have been incredibly difficult. My husband and I are desperate to start our family. I am 35 and he is 44. I’ve grown weary of waiting and scared with each cycle that passes – we’ve miscarried very recently – that I am not meant to be a mother. I know God’s promises are true. I know he is with me in the waiting, but I am so impatient. I am grateful to have a patient husband to balance this. He’s been so good about encouraging me to WAIT on the Lord. Some days are just much more difficult than others! Not only is waiting hard… waiting without trying to control the outcome is even more difficult. Thank you for the reminder. He is in charge. Amen. I find it difficult to wait. There is a family issue we have been dealing with for years and it seems there is no relief in sight. I and my family members struggle sometimes to keep the faith and through His word, I’m slowly getting better at waiting. Thank you for the reminder that God is not finished with us yet! Wow! Today’s devotion hit me right in the eyes. I had gotten what I believe was a word from God concerning a bad financial situation I had gotten myself and my family. “Say nothing, do nothing” How could this be right? It went against all I thought was the right thing to do, I prayed ad prayed for clarity but I could not discern that which was from God or my own desires.The pressure from my landlord for his rent and the fact that I had not shared this information with my family (“I got us into this mess I will get us out” – terrible pride as I see it now) made me more confused and afraid. Messages would come via scripture to trust God but still I was anxious. “Am I hearing right?”” could God really be asking me to ignore the Landlord?” He’s about to send the bailiffs!!! Until one day I was asked what the situation was by a family member… I caved in and gave the whole story and what I was hearing. Her anger didn’t last long. She was sad that I had elected to carry this alone and offered practical advice… I took it and am working out a strucured payment. I had worried (out loud) just yesterday that I may be acting just like Sarai, taking matters into my own hands and today… I see this! I’m struggling even more now, I’m so afraid that I disobeyed God. I realise that I was waiting ON God and not with him… What do I do now? Please pray for me. I really need to hear Him. Sometimes I don’t handle my waiting well. I can get angry at God and discouraged. Only with His help can I wait for His timing and answer. These blog posts never fail to find relevance in my life, but this post, in particular, has touched my heart. For almost about a year, I have been struggling to let go of the man I thought was going to be my husband; his rejection has left me heartbroken and afraid–afraid of waiting for him to come back, afraid of moving on, and afraid that maybe God does not know what He is doing with me. I am fighting to remain patient and to know that my worth is found in Jesus alone. I would love to have a guided study to help remind me of God’s plan for my life! Thank you, Proverbs 31 women, for all that you do for people like me! I’m unaware of your whole circumstance, but sounds similar to mine. Want you to know I WILL pray for you. Honestly I’m not waiting that well at all..,feel like my life is in “pause” and I’m spinning my wheels. I’m 40, still single, and struggling with loneliness, isolation and illness. I long for marriage and children but those haven’t happened yet and in the meantime I’m trying to find a career that works with my gifts and current (low) energy level. So I would benefit from this story. I recently lost my job of 18 years and to put it lightly, I was devastated. The people at this job were more like family than co-workers or employers. The boss and I had had a wonderful relationship where I even sat down with his wife and son when his son’s girlfriend had gotten pregnant to give a testimony of what life is like having a child at such a young age and with someone you are not married to yet because I had been down that road. Losing the job didn’t hurt me as much as realizing I was losing people I thought cared about me. I found out that my boss was looking for a replacement behind my back, which totally blew me out of the water. He never indicated I had done anything wrong, still acted the same with me (kidding around) and there was nothing to indicate why he wanted to replace me. I immediately got offended and started looking for a job so that I could quit before he fired me. I took the first thing that came available to me and I did not like it. Because I didn’t wait on God and jumped ahead with my own plan, I was bitter and angry and could not get past that because I still blamed my ex-employer for putting me in a situation where I had to take a job I didn’t like. Once I decided to trust God and wait on His timing and not my own, a job that I love actually fell in my lap. Even when it is hard, trusting God is always the right answer. Sometimes I *think* I’m waiting well- Hey God, look at me! Your girl over here trusting You! But really, I’m not. Trying so hard to believe that God’s got my biggest desire. I have not been waiting well. My dream is for a mutually loving romantic relationship and marriage. Rather than waiting with God, I have been impatient and entered into wrong relationships to satisfy my desire for a relationship. As a result, I usually end up giving my heart to people who don’t feel as strongly about me. It is so true, I don’t wait well. I usually end up thinking that I can do this myself when time goes on and nothing happens. But the truth is that God knows best and my actions are always second best. So here I am ready to learn how to wait on Him. I never was a patient person but it is getting easier the longer I walk with the Lord! I am so grateful for the changes he is making in me! This message definitely helps me not lose patience! The struggle is real.. waiting.. I’m not so good at it. I instead become anxious and frustrated. I want to DO but instead I need to pause and wait.. I hope to be able to do this study. I think it would be perfect for the season I find myself in. Thank you for your words of encouragement. After reading this, I realized that I tend to brush off my dreams as though they are impossible. Reading this post helped me see that God knows every dream and desire of our heart, and His timing is always perfect. I would love to win this Bible Study kit. It would be great to be able to go through it with my husband who is going through a difficult time of waiting as well. God bless you! I am now a widow. My husband died unexpectedly Dec 1. My heart has a huge hole in it. I came across this site with God. There are now many things I wait on. The perspective to wait WITH God helps me in Gods Waiting Room. I would love to get the DVD and help other widows who suffer with the emotional trauma of loosing their beloved. I can so relate. I struggle to remember God does have my best at heart – lots of childhood baggage that cloud my perceptions at times. In addition to many warped perceptions, I often heard that “God won’t help those who don’t help themselves – or who are bad.” So when the “dream” big or small seems to be taking too long, I tend to think something is wrong with me – either I’m not working hard enough or I’ve screwed up in some way that prevents God from acting well on my behalf. And, I see how my acting ahead make things harder – though I also see where He has redeemed despite me. Thank you for sharing this timely reminder. I’ve always felt God drawing me to teach. I envisioned a paid teaching job, God is showing me His vision. My husband & I have been called (as of September 2017) to lead our church’s youth group. I think this series would be AWESOME for us to share with them as we encourage them to seek God in their lives and prepare for His plan – and the timing He has planned. Waiting, in the microwave World we live in where we get everything at the touch of a button (my remote to my on demand TV is even on my smart phone no waiting there) waiting seems to get harder and harder. And waiting quietly doesn’t happen very often. My husband and I were once a witnessing team for God…Loving, compassionate yet bold. Then he was deployed and PTSD took over his life. Our whole lives changed, I found myself married to a stranger. Many well intentioned wonderful folks encouraged me to pack my kids up and leave. However, I had a revelation from God on the situation. I was not shown any amazing change in my husband or millions that he would one day reach again. No, it was very simple God loves my husband more than even I could imagine and He showed me a glimpse of that precious love and then reminded me that right now he only trusts me. And if I am his only life line and that is my one ‘job’ right now then I can’t leave. So I wait…with God’s strength, peace, unconditional love (and boy am learning a lot about unconditional love). I am waiting on just the promise that my wonderful husband will trust in God once more. This study would be great for our small group. Waiting with God during this season of uncertainty. My job is being re-located to another state, so my last day is in June. My husband is looking for a new job in the hopes of finding something that will increase his salary so it covers what I was making so that I don’t have to work anymore. I’ve pray for 15 years to be home with my children and we feel this is God’s perfect plan and answer to that prayer – however, we don’t know if my husband will find a job that will cover the expenses that we have and we don’t if and when that will happen. So, there are many things that we are Waiting on and its so easy for me to want everything to work out in my planning and timing. Its a struggles at times for me to trust God with the timing – I know how I want things to go but that isn’t always how he works. I would love to read this book and receive the teaching from the video to help me to continue to Wait with God well. Waiting should be my spiritual gift since I have waited for most of my life, sometimes giving birth to stillborn dreams or miscarrying all together. At 41 I’m still waiting on dreams and like Sarah it seems as if I’m too far past my youth to realize them. Like you, I know all the truth to stand on, but there was a struggle in the wait that perhaps “time” was a voice of truth…”if it was going to happen it would’ve happened by now.” I’m not sure if I have been successful in the wait. I suppose sometimes yes and sometimes no, but I have learned how to strengthen myself in the Lord. I have learned a relationship and knowing with Jesus that is deep and real because of the wait. I have seen his faithfulness in spite of the wait. In conclusion, I had very different plans for my days, and my youth, but this journey with God has been the sweetest one I could’ve asked for. He truly got all my firsts and that isn’t something everyone gets to do. I’ve been waiting for what seems to me, a long time. I keep reminding myself that my time and God’s time are quite different. It is hard when you cling to the illusion of control. None of us have any type of control. Would love to know how to make the waiting a bit easier. I won’t lie. I’m not handling it like I should. I’m falling apart at the seams one moment and standing strong the next. My faith wavers with each passing minute. Ironically I did get this book, but haven’t yet read it. But I was just thinking about a day ago how I really should read that book. God does have wonderful timing. The study would be a wonderful companion . I would love to do this study. I feel like I’ve been waiting for more than 10+ years in my professional and personal lives, and the longer I wait the less clear I am anymore what it is that I am waiting on, what is my purpose, and if what I thought my hopes were (based on God’s Word) are actually legitimate or they are a product of my fleshly desires. I feel that i need to re-connect with God and regain some of the confidence, contentment, patient and clarify in this continuous waiting season. Your topics are always so spot on. Thank you for addressing the everyday issues we all struggle with. Waiting, being patient when we don’t see the big picture, trying to hold on, it’s such a struggle. Thank you for reminding me god always has his best in mind for me. This is a very good eye opening experience. I️ have always wanted to be married. Lost my boyfriend about 11 months ago and I️ find myself in either toxic or weird relationships because I️ don’t know what it means to wait for God’s plan for my life! To win this would be amazing because I️ think seeing others experiences put things into perspective for me. But this was a very enlightening experience to see how I️ am also like Sarah. I can’t wait to do this study! I don’t feel as if I wait well. Sounds like a great study! I would love to have it & possibly share with others in my church & community! I am in the midst of a very difficult waiting period. After 10 surgeries to remove endometriosis, losing 3 babies, an ectopic pregnancy where I lost my right tube and I hysterectomy, I have waited for our child to come. My husband and I began the fostering process last year, but after having then being diagnosed with fibromyalgia we had to ‘put a pin’ in that too…so I wait. I am told by my Christian friends that my healing is coming…so I wait. It seems like all around me friends and family move on with their lives. New jobs, additions to the family, new homes…yet I wait. The fibromyalgia has me bedridden many days. Other days I am able to ‘potter’ around the house. The pain and fatigue are relentless.The things I so took for granted like taking a shower or being able to style my hair are now my daily goals. I feel that I have been stripped bare. I am emptied out. “God won’t waste our wait . . .” I love that. I’m in an in-between season that feels like it will last forever. In fact, the Holy Spirit whispered to my discouraged heart this morning, before I even got out of bed, “Diana, you’re in the in-between. This is not the end.” I’ve become much more patient and have been blessed with rest in the Lord, but there are days–and today is one of them–when I start to panic and despair starts to take root, wondering if this is really it and there’s nothing more for me. Thank you so much for your wise, encouraging, Spirit-filled words.